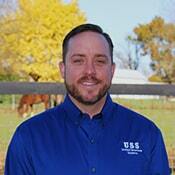 Bobby King is the sales manager for USS. Bobby spent 15 years in the printing industry as a press operator before deciding to join the family business. Bobby worked with USS part time for several years before joining the team full time in 2010. Bobby has been married to his wife, Bridget for 9 years and has been blessed with two sons; Spencer and Mason. Bobby enjoys helping out in his church and an occasional trip to the Smokey Mountains.